Rich, smooth chocolate ganache enclosed in a soft, superfine cake that was steamed, not baked, complemented by a pink coconut milk-flavored 'doily' (roti jala). The Royal Selangor Pewter (RSP) Jelliriffic! Challenge is a stress test too because a recipe a day for 30 days is tough. There's the rush to make the jelly which may not turn out right, the rush to take photos before the sunlight goes, the rush to write before the midnight deadline and in my case, the extremely frustrating struggle with an unstable Internet service in the past 10 days. TM Net has been looking into the problem but so far cannot solve it. My friend Veronica had suggested that I make a lava/volcano/molten chocolate cake with the moulds. I had thought of that very early on but RSP had confirmed that the moulds can be steamed but not baked. If I steam my cake, how will it turn out? Will the cake be too soft? Will the lava flow or set? Against my resolve, I did leaf through Rose Levy Beranbaum's Heavenly Cakes two nights ago. One of the recipes in the book was the molten choc cake and even Rose had problems getting the 'lava' sometimes, something I've experienced too when I left the cakes in the oven for a split second too long. Rose's solution, the clever girl, was to make choc ganache balls, freeze them and place them into the cake batter. More hassle than the usual lava cake recipe but definitely something to try if it is guaranteed to give lots of lava. As I started to weigh the ingredients, I suddenly thought of the infamous red velvet cake, a cake I feared eating because a standard 9" round cake has a bottle of red coloring in it. So there I was, very excited as I started to make not just a steamed choc molten cake, but a steamed red velvet molten choc cake with the Jelliriffic! mould. Wow, I thought, you're quite creative. As I took my food coloring out, I suddenly thought "Hey, why red? Pink is the color of the month!" And that's how the red velvet became pink velvet. I felt SO clever. The first cake broke when it was turned out. The cake was too fine, too soft and there was so much lava that it had seeped through the cake and weakened the cake in the middle. The mould was narrow where the ganache ball was placed. It was about 2 pm but I didn't panic because cakes are easier than jellies. Jellies need time to set. For a minute I thought about going ahead with the jelly Christmas tree that I had already made the night before. I took a spoonful of the failed cake and jumped. The cake was soft, fine, moist, delicious and there was plenty of rich smooth choc lava oozing out of the cake. 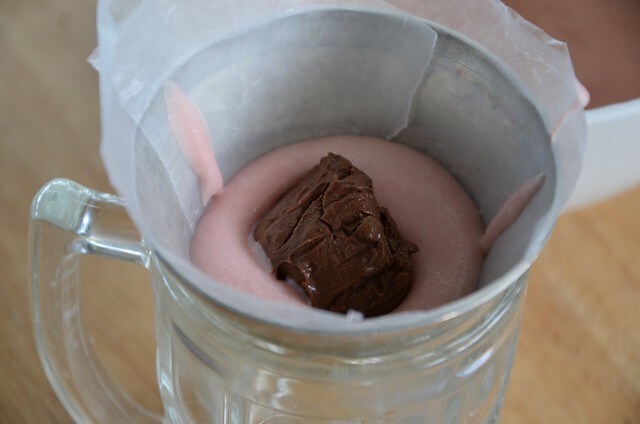 I had to re-try the recipe again, tweak it for the mould, and share it with you all. But I had a problem. How do I prevent the lava from seeping through the cake, and how do I prevent the cake from breaking in the middle where the lava was? It was more work but what I did was steamed 2/3of the cake, then placed the frozen ganache ball on the steamed cake, top with more batter and steamed again. That this cake turned out so well is one of the best moments for me in the Challenge. I really am very proud of this cake but the real credit goes to Rose for her fool-proof lava and a recipe that makes the best velvet cake, pink or red. I've increased the amount of flour to make the cake firmer for the mould and replaced the buttermilk with milk because buttermilk is not available here. The only thing I'll change next time is the color because I wanted a baby pink but my cake turned out a salmon pink unfortunately. But wait. Just a minute ago when I was waiting for my photos to load, I googled and found lots of people have beaten me to the pink velvet cake. It's just that I didn't know about it. No matter, I still feel pretty good that I thought of it too. 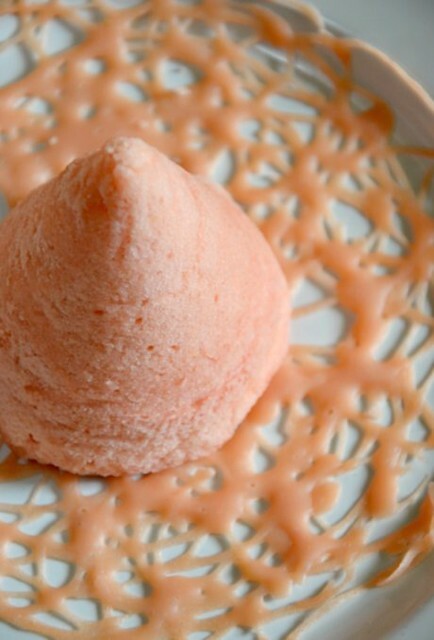 And oh, don't you love that pink lacy crepe? It's a Malaysian crepe called roti jala ("net pancake") made with flour, eggs and coconut milk and is usually eaten with curries. I've blogged about it here and here. If you've never eaten it before, you must try it. It tastes and smells as good as it looks. Moulding the choc ganache balls. This was the first cake. An egg stand comes in handy in holding the mould upright. --Heat the cream until just about to boil, add the choc and stir until choc is melted. You can also melt the choc in the cream over a double boiler. 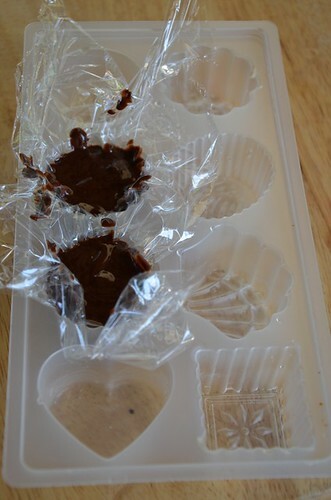 --Line 3 ice cubes cavity or small jelly moulds with cling wrap and spoon the ganache in. Fold the wrap over to cover or use another piece of wrap, and put into freezer for 2 hours or until frozen. *If not steaming in the Jelliriffic mould, use 25 gm flour. 1. Prepare a bamboo steamer or a steaming pot. 2. Whisk egg white with the cream of tartar until just after soft peaks stage. 3. Sift the flour with the baking powder. 4. In a bowl, mix the butter and oil using a hand-held electric whisk and whisk 1 minute, then add the flour, milk, vanilla and color. 5. Add the egg white into the flour mixture in 2 parts, beating 30 seconds each time. 6. 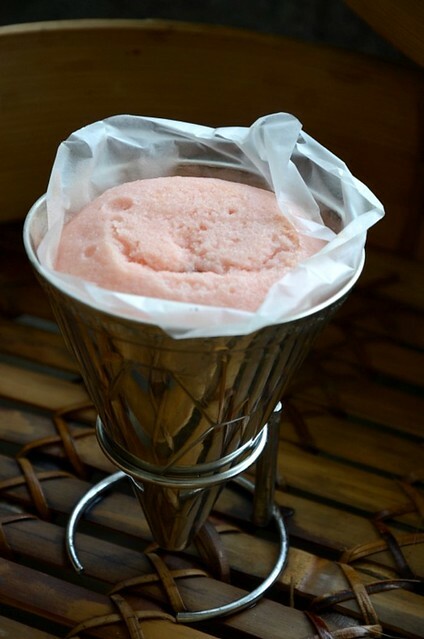 Place two Nick Munro moulds on heat-proof stands and line with grease-proof paper. Fill the moulds 2/3 up and steam 10 minutes. Keep the remainder of the batter in the fridge. 7. Carefully place a ganache ball onto the centre of the steamed cakes and fill up the moulds with the remaining batter almost to the top, leaving 1/2 cm for the cake to rise. Steam 15 minutes this time (the mould is thick). Remove and let cool (can still be warm) before turning out onto a plate carefully. If weather is cold, you can put the cake in the microwave for a few seconds to warm through. Serve with vanilla ice cream. For the lacy crepe, go here. Pretty interesting! Pink instead of Red Velvet. 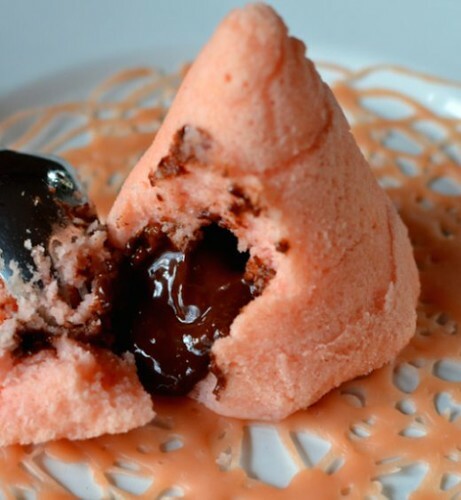 The Pink Velvet Molten Chocolate Cake looks pretty and I love the lacy crepe-'doily,' how clever! You are winner for this. Aiyoh, Terri, what a bomb! Rose, you are a genius, frozen balls! 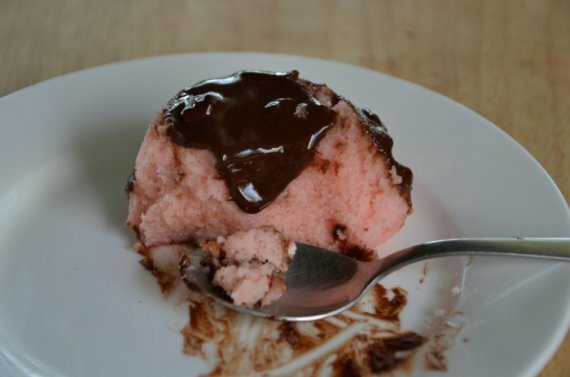 And Terri, PINK molten cake, you are a genius too, lol! Seriously, I didn't think you could pull this off! I echo Winston's sentiments. I know you must be SO tired and maybe can't wait for this to be over but I secretly wish there was another month of opening this blog everyday and be hit for sweet, pink, lovely surprises. Thanks for all your blood, sweat and tears, Terri. You have made a lot of people happy and inspired more others. Another pretty creation, love how you dressed it with some pinky lace too! Enjoy every one of your creations. OMG!!! There's not much more that needs to be said about this! The pink is awesome. It looks so fluffy and soft, but that chocolate! Molten lava is a perfect description! 3 Studies SHOW Why Coconut Oil Kills Fat. This means that you literally kill fat by consuming coconut fat (including coconut milk, coconut cream and coconut oil). These 3 researches from big medical journals are sure to turn the conventional nutrition world upside down!